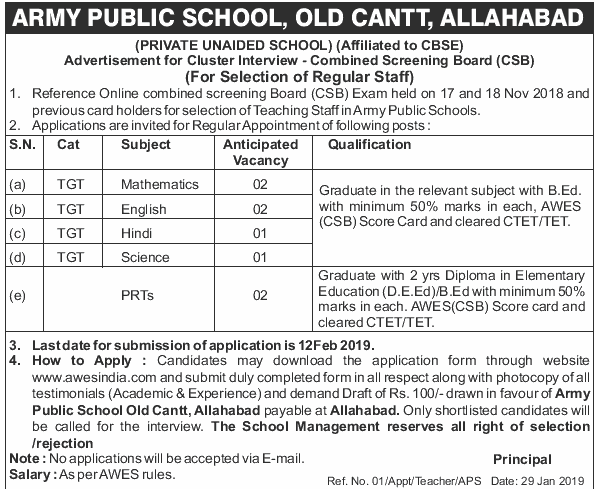 Army Public School Old Cantt Allahabad Vacancy 2019 Apply Online for APS School & College Jobs on Cluster Interview in Army School Old Cantt Allahabad Vacancy 2019. 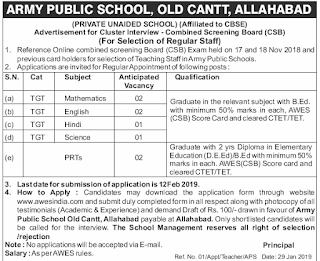 Army Public School Old Cantt Allahabad Vacancy 2019 In Place of Allahabad Old Cantt there is one army school who invited application from eligible candidates that wants urgent jobs especially in govt sector. Army Public School old cantt Allahabad is private unaided school, affiliated to CBSE Delhi. The school authority published advertisement for cluster interview Combined screening board (CSB). Central School Recruitment 2019: These Posts may accept that application who has given online combined screening board exam held on 17 and 18 November and Previous card holders for selection of teaching staff in army public school vacancy in Prayagraj. D.EL.ED/B.ED with Minimum 50% Marks. How to Apply: Candidates may download the application form through official website www.awesindia.com and submit duly completed form in all respect along with photocopy of all testimonials (academic & experience) and demand draft of Rs 100 drawn in favor of Army Pubic School, Old Cantt Allahabad, Payable at Allahabad. Cluster Interview Jobs: Selection of Shortlisted candidates will be called for Interview. The School Management reserves all right on selection and rejection of candidates during appointment letter. Note: No application will be accepted via email. Salary of Army Public School who will appointed as TGT PGT Primary Teacher is based on AWES Rules. How to qualify: You must qualify according to your subject and prepare important question and answer.